The traditional Indian bridal saree is red and resplendent and still happens to be the number one bridal ensemble choice among brides in the country. However, the times are changing and so are the trends including bridal fashion trends. A growing number of Indian brides are opting for a modern version of the bridal saree in colors apart from red. This is not a controversial choice and these choices have been pretty well accepted. So; if you are a soon to be bride and you do not wish to wear red on your wedding day; you can take joy in the fact that you have multiple other options. Don’t Want a Red wedding Saree? Here are 10 other Colors to choose from! Red is definitely a vibrant and bright color that effectively matches the revelry and celebrations revolving around an Indian wedding however it is not the only bright, vibrant and festive color on the spectrum. There are multiple bright shades that make for great wedding sarees and one must also consider the fact that many brides are opting for rich luxurious colors on their wedding day or even classic pastel shades for a more sophisticated look. Listed below are 10 bridal saree colors that are a refreshing detour from the traditional red bridal saree. Scroll down to know more. Pink is one of the nearest shades to red and it’s no mystery that pink bridal sarees are trending in a big way in recent years. 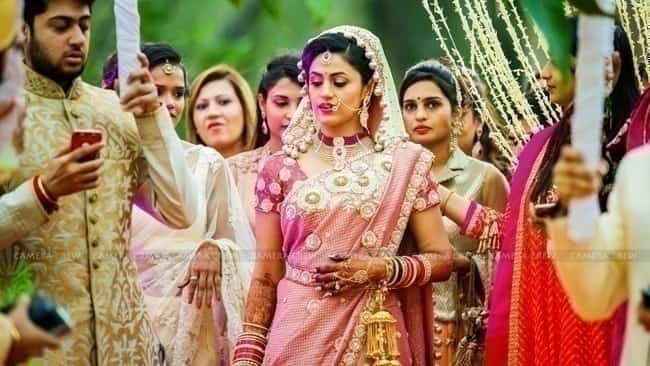 The color pink is feminine yet festive, celebratory yet not too loud; it is no wonder that brides to be are opting for pink bridal sarees in growing numbers. The pink bridal saree in the image above is an excellent example of what to expect. These sarees are often heavily embellished and are of net fabrics. The color yellow is yet another excellent option when considering wedding sarees in colors apart from red. Yellow has a distinctive festive and celebratory vibe that is hard to deny and bright yellow can be just as effective as vibrant red; when a bride needs to stand out in a crowd of wedding guests and family. 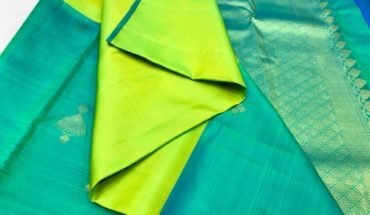 Perhaps you didn’t consider the viability of the color green in terms of wedding saree colors however different bright shades of green can make for great wedding sarees. When exploring the different options for bridal saree colors; give a green saree like the one in the picture above; a fair chance. If you wish to look the part of the traditional Indian bride minus the red saree; substituting red with maroon can be a brilliant idea. While red is vibrant and bright; maroon is a darker and richer shade that effectively denotes bridal opulence. 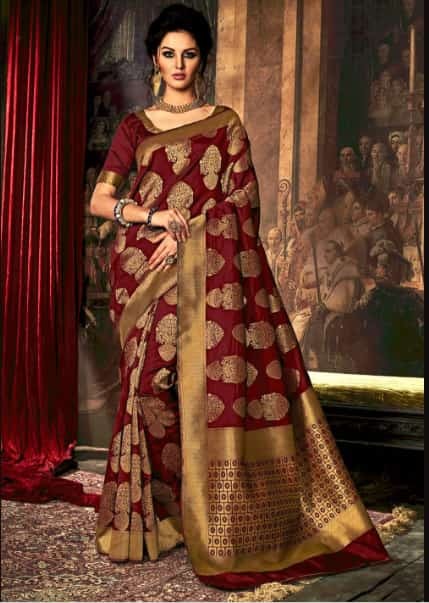 Go with a maroon bridal saree such as the one in the picture above for a rich and luxurious bridal look. Gold embroidery on a maroon saree; more often than not brings out the bridal opulence; most brides are on the lookout for. Prussian blue is a rich opulent color that makes for great bridal sarees. Rich lustrous Prussian blue fabric has a royal vibe that can transform any bride into a princess. 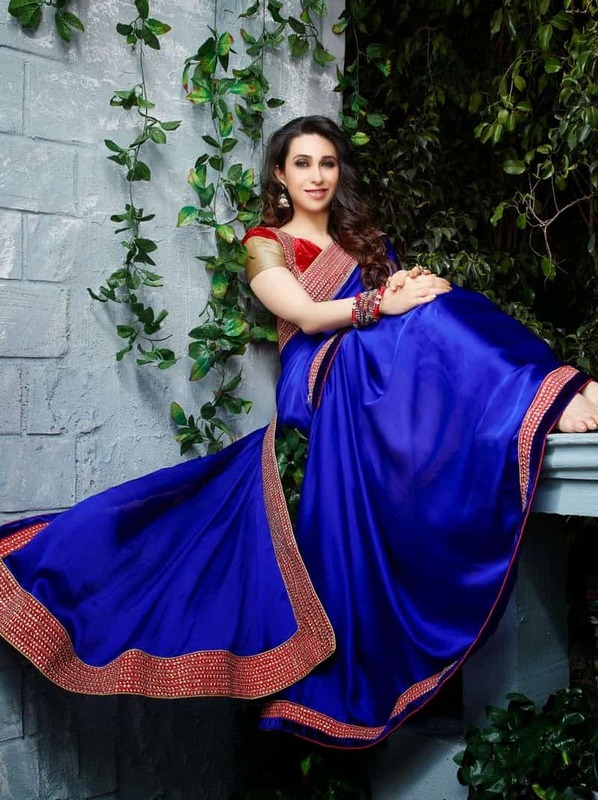 The advantage of wearing a Prussian blue bridal saree is that it can be easily matched with a red blouse so that you do not have to completely eliminate this traditional bridal color from your wedding ensemble. In ancient times; the dye used to color fabrics purple was very expensive and purple clothing was limited to aristocrats and royalty. Purple remains true to its royal vibes even today and you can opt for purple bridal saree for an undeniably royal bridal look. 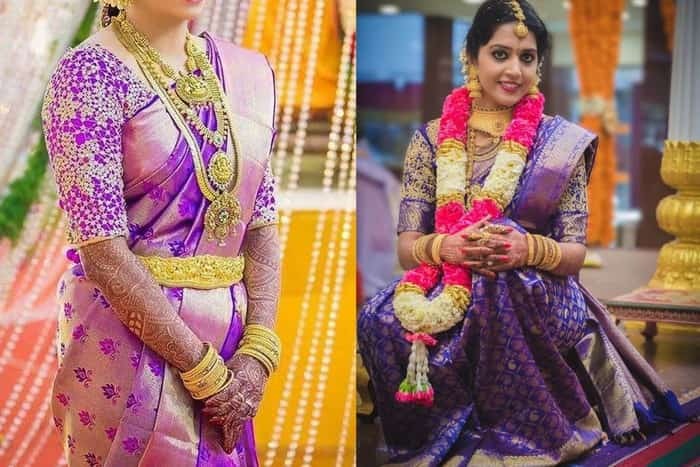 It must be noted that purple is not an unusual bridal saree color and the brilliant purple Kanjeevaram silk saree in the picture above; is an excellent example of the point being made. Owing to the popularity of pink in terms of contemporary bridal saree; this rose pink bridal saree had to be added to the list. Rose pink is a delicate and feminine color and when combined gold weaves, embellishments and stonework; it makes for great bridal sarees. It’s hard to deny the appeal of gold to the average Indian bride and a gold saree combined with gold jewelry for a bridal look is good overboard in a great way. Very rarely; too much of something is not a bad thing and a gold bridal saree combined with gold jewelry is an excellent example of the point being made. Silver is yet another popular shiny and shimmery wedding color and a silver bridal saree can have just as much as bridal appeal as the traditional red saree. The silver saree in the picture above is an excellent example of the point being made. 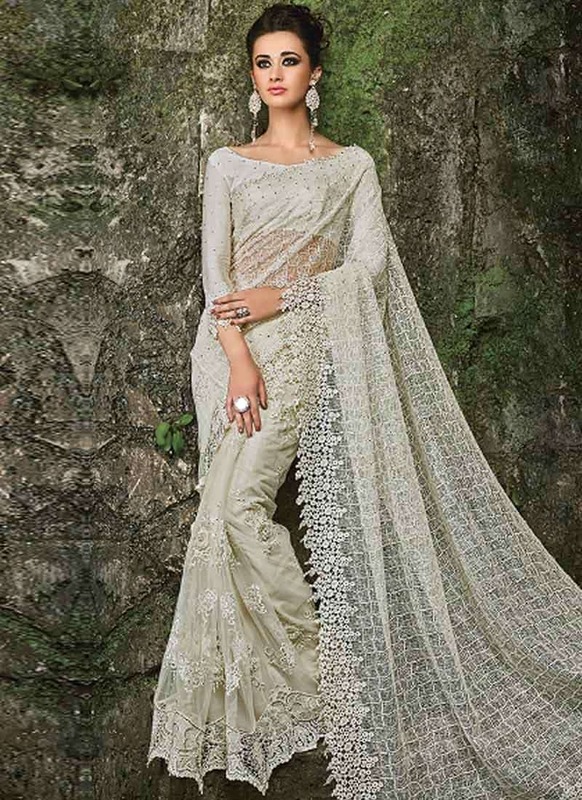 Off-White isn’t necessarily a popular color for celebratory occasions however changing trends have brought the off-white bridal saree under the spotlight. 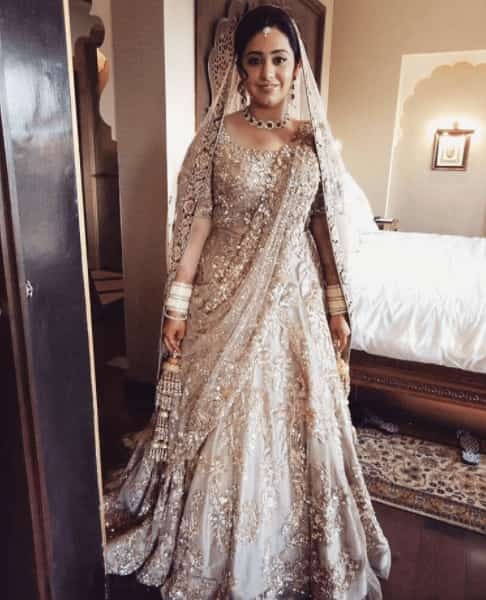 Off-white by itself is not a great bridal color but when combined with clear stonework, glass work and crystals; an off-white bridal saree can result in an elegant and regal bridal look. In conclusion; one must note that while red suits Indian skin colors to a large extent; one may need to choose from the additional colors listed above; based on a look test. Additionally; none of these colors make for great bridal sarees by themselves. However, when combined with embellishments and embroidery; they can easily replace the traditional red bridal saree.